Only if there was smell-a-vision! Orange ricotta pound cake spiked with amaretto– doesn’t the title itself make your lips pucker? I found this delightful recipe from the lovely Giada. Her Italian background explains the unique ingredient list and in fact, orange and ricotta is a common Italian combination for sweets. The ricotta provides the incredible moistness while the orange zest and amaretto perfume the cake with hints of citrus with an almond background- it’s heavenly. It goes very well with sliced strawberries and if you must a dollop of whipped cream. I brought it to a tea party and all I heard for the first few minutes after serving was, mmmm. Nodding their heads in great approval, everybody asked for a second slice. Even friends on diets couldn’t resist. 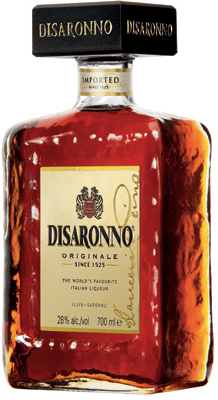 purchase Disaronno Originale. The recipe dates back to the early 16th century and consumers consider it the godfather of amaretto. There is no substitue. The decorative container reminds me of perfume bottles and I feel regal every time I hold it in my palm. It costs about 28 USD and is a great investment. You can use it in baking or you could enjoy it as treat. It’s an excellent way to top off any meal. In my experience, amaretto and friends have magical properties that keep good conversation flowing. *To keep your loaf pan from scratches and easy clean up line pan with parchment paper. Cut a piece of parchment paper big enough to wrap all sides of pan, cut diagonal slits at each corner and fold into pan. This entry was posted in Cities, Taste and tagged amaretto, disaronno, jeno, oranges, pound cake, taste, tea cake. Ovens are hard to come by in China but hopefully when I visit in a month, I’ll be baking up a zesty storm.